Gio and I were in Los Angeles over the weekend for a good friends book launch and gallery opening and of course we HAD to find a place to get some ramen. After looking around for places to go (We know the usual places in Little Tokyo etc.) we figured out it would be easier if we stayed near our hotel in Hollywood. We didn’t have a ton of time, and the prospect of spending ~$80 in cab fare wasn’t too appealing. So after looking on Yelp, we came across Takara Ramen Bar which was walking distance from the hotel. A newish place on Sunset Blvd., the restaurant had an open kitchen facing a row of booths against large glass windows. 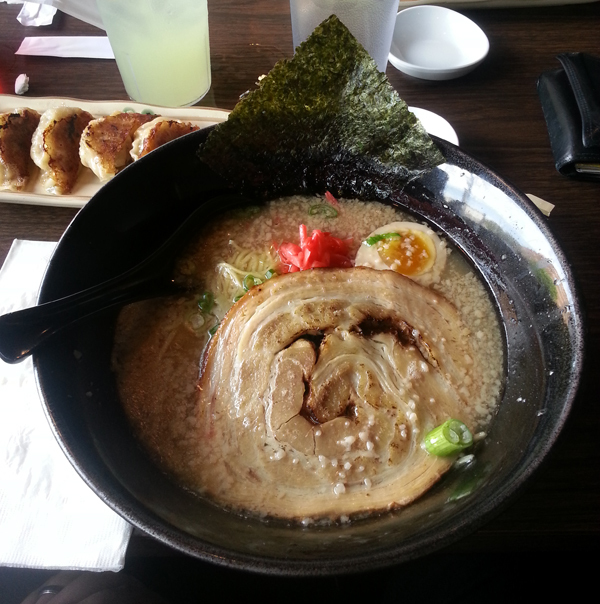 We sat down and after looking over the menu I ended up going with one of my favorites, Tonkotsu Ramen. Takara’s Tonkotsu ramen includes the following toppings: Chashu, seasoned boiled egg, bamboo, red pickled ginger, green onions, and seaweed. First impression when the bowl arrived was that it looked really nice. Toppings were all fresh, the chashu was HUGE, and there was tons of the trademark floating fat and bits that should be in a tonkotsu broth. I decided to start with the chashu since it was so very right up in front. The taste and texture was fantastic, and honestly, one of the better I have ever had. It had a great smokey flavor from being slow roasted and a really nice creamy heavy taste from the bits of fat left on the pork. It also tenderly fell apart as I picked at it with my chopsticks and was perfectly cooked throughout. Beyond the other toppings which were as expected, their seasoned boiled egg really stood out. Cooked perfectly, and seasoned really well, it was with the chashu the stand out of the dish. The yolk nice and custardy, and the “meat” of the egg nicely salted with a slightly sweet hint behind it. The noodles themselves were somewhat average, not bad, not great, but right in the middle. They were cooked properly and had a decent flavor, but didn’t really stand out as anything really special. Now on to my biggest gripe with the dish, the broth. For a tonkotsu broth it was lacking in body and heaviness. 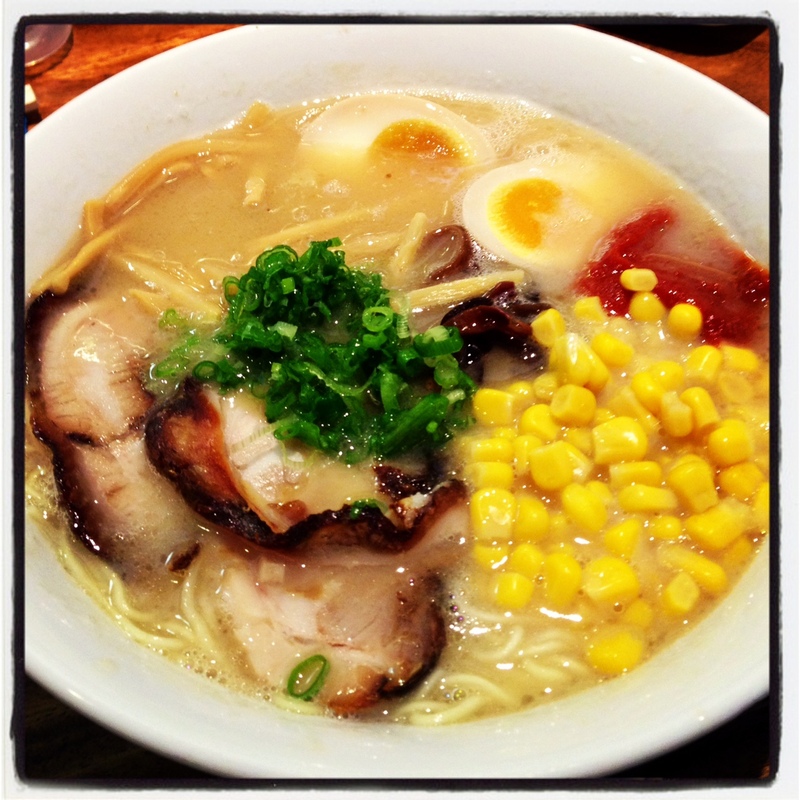 It was too clear and didn’t have the heavy, creamy, robust porky flavor that usually is found in a tonkotsu broth. It was seasoned well, with a nice salty finish, so it didn’t taste bad, it was just not what I would call tonkotsu. The hard part is visually it was almost there, having all of the floaty fat and gelatinous bits you would expect. Given all of that it was still an ok bowl of ramen and if I were in the area again and needed lunch I would stop by Takara. The broth brought this one down for me and as a result I give it a 3 out of 5. When traveling to Las Vegas, very few people venture off the strip to the suburbs, I did. Why you ask? Well for the love of Ramen of course! With the glowing recommendation of a trusted friend, I visited MONTA JAPANESE NOODLE HOUSE in the Chinatown area of Vegas (yes, Vegas has a thriving Chinatown) for some Ramen goodness. There was a line-up out front which is always a good sign, we waited for 25 minutes, then our name was called. Once inside, the room is tiny, a handful of tables with a few seats at the bar in front of the open kitchen where the cooks are concocting away in a steam of broth. This place is known for it’s Tonkotsu (a thick hearty pork broth) so I went with it but made it spicy, I also had to have it with Nitamago (Seasoned Hard Boiled Egg). We waited 10 minutes and were served with a glorious bowl of Ramen. I’ve had Tonkotsu before but this was the thickest I’ve had it and sweet fancy moses, it was tasty, add the kick of fresh chili spice and I was in heaven! Tonkotsu is traditionally made from boiling bones, fat and collagen for many hours and this broth did not disappoint, it was quite honestly, the best Ramen broth I’ve had the pleasure of tasting thus far. The egg is an important part of the Ramen to me and I was disappointed that it wasn’t included in the dish but it was available as an addition and I’m glad I got it, the seasoned hard boiled egg is a tricky one to master but Monta got it right. Hard exterior, runny interior with just a hint of herbs – perfect. While the veggie toppings were fresh, I was disappointed with the Chasu Pork which I found dry and fatty which would have elevated this to a perfect Ramen score, alas, not so much when the meat is a letdown. This was a pleasant surprise for me, after many monstrous meals on the Strip, it was great to find “a local favorite” and have the best meal of my trip! I am pleased I braved the voyage to Monta Ramen and I highly recommend it to anyone who has a free hour or two in Vegas, the ramen is well worth it but be prepared to wait.